India is a land of diverse cultures. Its rich art and traditional culture are respected in and outside India. That’s why Indian handicrafts are much in demand. Indian handicraft is sold both on a national and global scale. 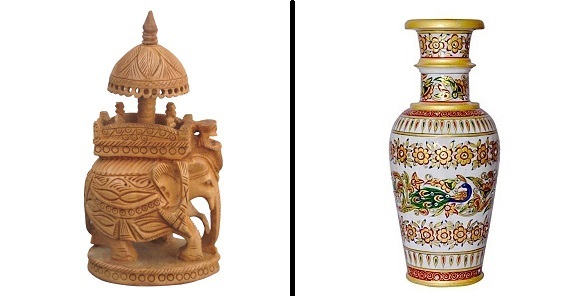 These handicrafts are bought to enhance the décor of homes. You can choose from an array of handicrafts which add a majestic touch to your space. When it comes to making handicrafts, no place does it better than Jaipur! The intricate designs featured on Indian handicrafts made in Jaipur are a proof of the brilliant craftsmanship. One can see a reflection of mythological elements and traditional folklore hidden in these designs. These handicrafts are sold globally at jaw-dropping prices. The little handicraft items are very useful to make your house look appealing. Besides buying it for yourself, these handicraft items are ideal for gifting. Thinking of the perfect gift this season? It has to be handicrafts. The handicrafts made in Jaipur are not only meant to decorate your space but are eco-friendly too. Whether you are attending a housewarming ceremony or a wedding, a richly crafted handicraft item is an ideal pick. Why handicrafts are considered as the perfect gift? Nature lovers who love gifting eco-friendly products can opt for Indian handicrafts as these products are made of harmless materials and the designs reflect the Indian culture. Each handicraft item has one thing in common – they are so well crafted in terms of carving and usage of colours that one cannot resist buying a piece or two to decorate their house. There are people who live outside India and have a thing for Indian culture and handicraft items. The handicraft items are ideal for those who admire the quality and hard work that has gone into making these items. Based on our new offering, we have partnered with these local manufacturers to bring superior quality handicrafts straight from Jaipur to your doorstep.